Last week, View Vehicle Record (VVR) moved from alpha to private Beta. Twelve companies already on DVLA’s fleet scheme have been set up with login details to test the system. Companies range from small to very large, giving us a good representation of our customers’ needs. This service is free of charge, available 24/7 and easy to use. So what’s the service and who can use it? VVR gives fleet operators on DVLA’s fleet scheme the opportunity to view details on all vehicles within their fleet via a secure login process. They have the option to download this information in a ‘Comma Separated Value file’ (CSV). A CSV file consists of any number of records separated by line breaks; each record consists of fields, separated by another character or string, eg a comma or tab. A CSV is similar to an excel spreadsheet. DVLA fleet scheme operators can use this service as part of their fleet management administration process or simply view information. Tuskerdirect Limited has been privately testing the VVR system for almost a week now and so far I have to say it’s great! The login is easy and straightforward as is the functionality of the system. The data displayed on the screen is easy to follow and simple in its design which makes it easy on the eye and straightforward to follow. 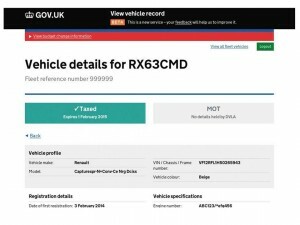 The top 3 boxes within the full fleet details are a great snapshot of data on file displaying full fleet figure, Vehicle Excise Duty concerns for the next month, including SORNs against fleet along with all the vehicles that are 30 months and over, making vehicles due for a MOT easy to identify. The search functions available have been created through workshop sessions that have been running over the last year and for us seem sensible and are extremely user friendly. Searches can be based on individual vehicles or on a group and can be drilled down as far as the chassis number. Overall I wish we had this a long time ago, it’s fantastic. Once private testing is complete, VVR for fleet companies will go into public Beta and be available to all DVLA fleet customers through GOV.UK.